Gloria Bird is a member of the Spokane Tribe of Washington State. She attended the Institute of American Indian Arts in Santa Fe, NM in high school. After high school, Gloria attended Portland Community College in Portland, OR, an institution instrumental in fomenting one of her longest, on-going projects, a poetry collection on the Nez Perce retreat (1988 - present). The manuscript is titled, Scattered Red Roots and is unpublished. PCC provided a wonderfully supportive environment, and she owes a great deal to the attention received while a student there. Gloria then attended Lewis & Clark College in Portland, OR where she received her B.A. in English in 1990, moving on to the University of Arizona in Tucson, AZ where she received her M.A. in English in 1992. For five years after graduating from the University of Arizona, Gloria taught literature and creative writing at the Institute of American Indian Arts. In the summer of 1997, she was an invited workshop leader at The Fishtrap Gathering in Joseph, OR, where she taught a "Subversive Literary Strategies" workshop. 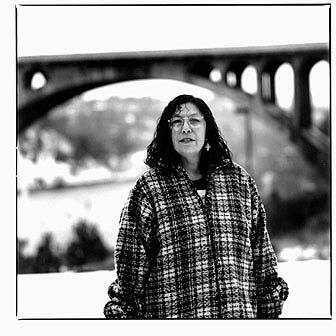 The same year, her second book of poetry The River of History was published by Trask House Books of Portland, OR, as well as, the anthology Reinventing the Enemy's Language , edited with Joy Harjo, et. al. Gloria is one of the founding members of the Northwest Native American Writers Association with Elizabeth Woody, Vince Wannassay, Ed Edmo and Dian Million, and was, for a time, a Contributing Editor for Indian Artist Magazine , and has served as a poetry judge for the SWAIA Annual Indian Market's poetry competition, both located in Santa Fe, NM. Gloria currently works for the Spokane Tribe of Indians in Wellpinit, WA, and teaches periodically at the Wellpinit Campus of Salish-Kootenei College. She is also currently an Associate Editor for the Wicazo Sa Review in which some of her critical works appear. The Wellpinit school system also has a website on the Spokane Tribe. Dawn Watch is a local grassroots group opposed to the dumping of radioactive fill at a defunct uranium mill site near Spokane, WA. This has serious implications for the Spokane Reservation. "The Exaggeration of Despair in Sherman Alexie's Reservation Blues "
Gloria Bird has received a Witter-Bynner Foundation grant in support of an individual writer in 1993, the Diane Decorah Memorial Award in 1992 for her book of poetry, Full Moon on the Reservation , and an Oregon Institute of Literary Arts, Oregon Writer's Grant, in 1988. The River of History , Trask House Press. Full Moon on the Reservation , Greenfield Review Press. River of Memory: The Everlasting Columbia , William D. Layman (editor), Washington Univ. Pr. Sylvia Vance (Editor), Univ of Oklahoma Press. This is an "official" site in that this page was constructed with the assistance and active collaboration of the poet, Gloria Bird. The website "author" is Karen M. Strom. © 1997-1999 Gloria Bird and Karen Strom.